and served the creature more than the Creator, who is blessed for ever. a. First of all look at the respect the Apostle Paul had for God the Creator. civilizations did in history over a period of thousands of years. same time as the body is a Law for the Soul. individuals that bespeaks of that internal and inherent Law of the Soul. written Law of the Bible or the unwritten law of the soul. religious hearers of the law alone. and through faith in the Lord Jesus Christ. calls living or walking or a lifestyle of “newness of life”. c. That plan of salvation is a gift least any man or religious group should boast. a. IN CHRIST there is no condemnation of Men and their offences. b. Those IN CHRIST must walk and live with a life style of not flesh but Spirit. of life IN CHRIST Jesus”. 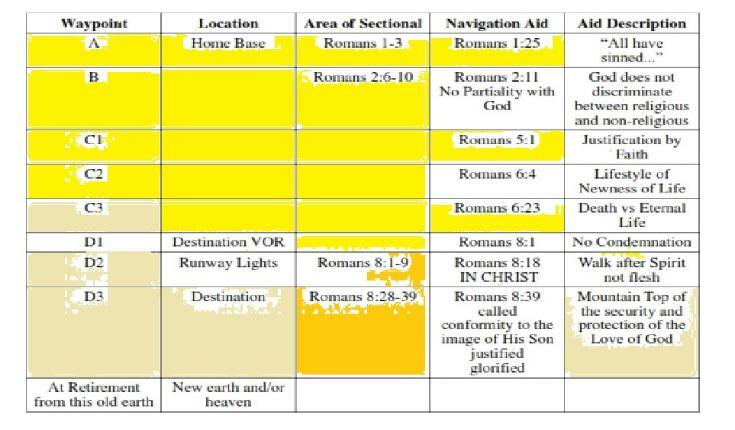 You can download this in PDF at "RomansFlightPlanDebrief".